Whereas lexical verbs, nouns, adjectives and adverbs constitute open classes of words, pronouns (like auxiliary verbs, numerals, determiners, prepositions, and conjunctions) form a closed class, i.e. the membership of the class is fixed. It is not usually possible, therefore, to add new words to a closed class. Pronouns (pro-noun meaning for-noun), are words that substitute for nouns or noun phrases, e.g. him, they, hers, yours, who, where. They are usually only meaningful after a noun has already been mentioned. For example, if I began a conversation with, ‘He told me to leave. He said it was important,’ it would be difficult for the listener to know just exactly who I was talking about. Who is the he I am referring to? Is it my uncle? The listener’s brother? A stranger? The use of the pronoun he without previously using a noun is potentially confusing. The conversation would be more readily understood if it had been phrased as follows, ‘Jeff told me to leave. He said it was important.’ This time it is obvious who is being referred to and it is clear that the pronoun he in the second utterance is referring back to the noun Jeff in the first utterance. The part of the utterance that the pronoun refers to (i.e. the noun or noun phrase) is known as the antecedent. 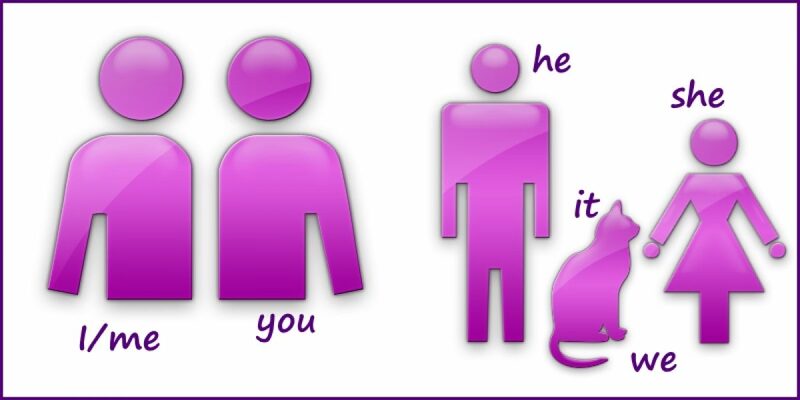 Pronouns can be subdivided into several categories. There are three subsets of personal pronouns: (1) subjective, (2) objective, and (3) possessive. This subset of personal pronouns can be summarized in relation to person and number (Table 1). These pronouns substitute for nouns that are functioning as the Subject of an utterance. A Subject is the thing, or person, performing a particular action. Consider the following. In this utterance, Paul is the Subject as he is the person performing the particular action of kissing. The noun Paul can be substituted with the personal pronoun he to give the following. Further examples of personal pronouns substituting for Subjects include the following. The person that has undergone Paul’s action of kissing is Judy. This is, therefore, the Object. A pronoun could now be used to substitute for this noun, as follows. Further examples of pronouns substituting for nouns functioning as Objects include the following. The third subset of personal pronouns is shown in Table 3. The title is self-explanatory, i.e. they are used to indicate possession of something (Table 3). The proper noun Graham is said to be in the genitive case when it is displayed as Graham’s. This simply means that it is signaling possession, i.e. the book belongs to Graham. In the following utterance, the noun dog is also in the genitive case, i.e. the bone belongs to, or is possessed by, the dog. Possessive pronouns, therefore, substitute for genitive nouns. The previous two examples can, therefore, be reformulated as follows. Further examples of the use of possessive pronouns are shown below. I think the choice is hers, don’t you? Reflexive pronouns refer to the same person, or thing, as the Subject of an utterance. The complete set is shown in Table 4. In this utterance the Subject is he and the reflexive pronoun that refers to the he is himself. In the following example, the Subject is they and the reflexive pronoun that refers to they is themselves. Demonstrative pronouns include the same members as those determiners that are demonstrative i.e. this, that, these and those. The difference in usage is that when these words are functioning as pronouns they are substituting for nouns. Consider the following utterance. In this instance, this is substituting for the noun book. In this context this is, therefore, a demonstrative pronoun. Now consider the following. who is going to speak now? Pronouns, such as nothing, few, many, all substitute for noun phrases and make reference to some indefinite quantity. Consider the following. In this utterance, the noun phrase five roses is constructed from the numeral five and the plural noun roses. Note that the noun phrase five roses makes reference to a definite quantity. That is to say, we know the exact number of roses that were given. Contrast this with the following utterance. In this instance, it is not possible to determine how many roses were given. The pronoun many refers to an indefinite quantity. This is, therefore, an example of an indefinite pronoun substituting for a noun phrase. Here are some further examples. Relative pronouns substitute for nouns in relative clauses. Briefly, a relative clause is a clause in which a phrase contains a relative pronoun that refers back to the head noun of the phrase in which it occurs. Consider the following. In addition, compound words such as whoever, whomever, whomsoever and whichever typically function as relative pronouns. The relative pronouns who and whom are typically used in traditional written grammar to refer to people (e.g. the girl who played the violin; the man whom I called). Traditionally, which would be used with non-humans (e.g. the cup which smashed) and that would be used with both (e.g. the cup that smashed; the man that laughed). Finally, whose is traditionally used as the possessive form of the relative pronoun used to refer to people (e.g. people whose income is low get in free) and of which is used for non-humans (e.g. the study of which we know very little). The restrictions of traditional written grammar are frequently loosened in spoken grammar, where there is a tendency to interchange relative pronouns, especially who, whom and that, e.g. Intensive pronouns are used to emphasize the noun or noun phrase that is being substituted (i.e. the antecedent). They consist of the same members as the reflexive pronouns, i.e. myself, yourself, himself, herself, itself, ourselves, yourselves, themselves. Consider the following. Here, yourself is functioning as an intensive pronoun in order to emphasize the antecedent you. We see that this pronoun is not functioning reflexively because it can be removed without any substantive change to the meaning, i.e. This time, yourself is functioning reflexively (as the Object of the clause). Now if we were to remove the pronoun this has a greater affect on the meaning, i.e.